we came home with loads of fruit from apple picking at stuart's farm over the weekend and wanted to come up with some new recipes. they may not be the most beautiful northern spy, macoun, baldwin and mutsu apples due to some late season rain but they taste great - it was so much fun to walk through the orchards on a cool overcast day, tasting apples before we picked them to ensure the most tart flavor and crunchy texture before filling our bags. we'll post a sweet apple recipe soon but on this cold rainy almost wintry feeling evening in nyc a savory dish felt more appropriate. there are many classic combinations but few are better than pork, apples & sage - this dish is a simple roast dinner and the apples become unbelievably tender and creamy. grease a large baking dish with 1 tbs olive oil. place pork roast in fat side up and season all over with salt, pepper and 1 tbs oil. arrange apples around meat and drizzle with remaining oil. 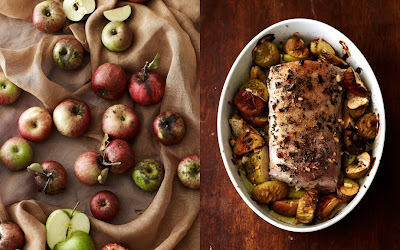 sprinkle pork and apples with sage and garlic. roast for about 1 hour or until temperature reaches 140 degrees F. let rest 10 to 15 minutes before slicing to serve with apples. enjoy! We picked apples from our neighbor's tree but didn't get nearly the variety sounds like you did. This is a tasty looking dinner, love how easy it is. And you cook it at 425? I wouldn't have thought to go that high. I'll def give a try. I think pork, apples, and sage is the perfect combination. Love it. This looks perfect for a cold Sunday dinner, so cozy. This is wonderful. Unfortunately, we don't have northern spy apples where I live. I remember them from my youth and sure miss them. Only get them occasionally when I return for a visit. Just curious as to whether you leave the skin on the apples or not.